Strange Victory Presents DAVID HOLMES GODS WAITING ROOM with very special guests THE LIMINANAS (Main Room) + French Disko (Green Room).. Gods Waiting Room takes over both rooms of the Black Box for a special one off night with one of our favourite bands of the last few years The Liminanas with special guest DJ’s, psychedelic visuals and one or two surprises..
One of France’s most loved treasures, The Limiñanas are Marie (drums/vocals) and Lionel (guitar, bass, keyboards and vocals). Hailing from Perpignan, the duo straddles the boundary between psych, shoegaze, and yé-yé. With hazy, reverb-laden hooks, combined at times with noisy distortion, and fronted by effortlessly cool vocals, reminiscent of Serge Gainsbourg and Brigitte Bardot, the band is at once timeless and quintessentially French. 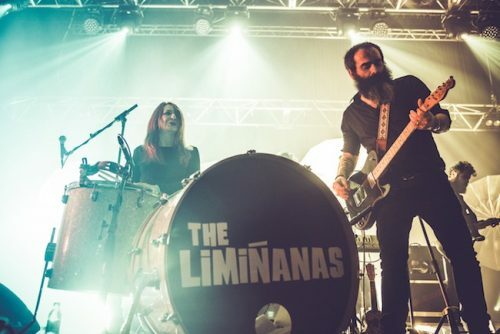 The Limiñanas, who have produced records in their own garage for the last ten years, released their first rarities collection ‘Ive Got Trouble in Mind’ through the revered ‘Trouble In Mind’ label in 2014. As with the first installation, ‘Vol. 2’ features rare and unreleased tracks such as the duo’s version of The Kinks’ ‘Two Sisters’ (produced by Anton Newcombe and remixed by Jim Diamond (White Stripes/The Sonics), a cover of The Lords of the New Church’s ‘Russian Roulette’ and live versions of fan’s favourites.